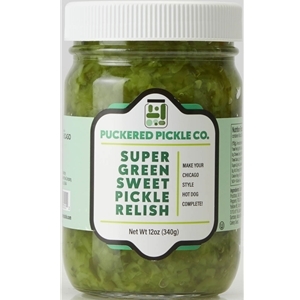 Craft the tastiest Chicago-style dog when you slather on Puckered Pickle Co. Super Green Sweet Pickle Relish. The flavor of this super-sweet, super-delicious relish flawlessly melds with chopped zesty onions, juicy tomato slices, tangy yellow mustard, tart dill pickle spears, perfectly pickled sport peppers, and savory celery salt to create a deliciously harmonious taste that will transport you to the windy city. If you're looking for a condiment that demands attention, then the neon green goodness of Puckered Pickle Super Green Sweet Pickle Relish is for you! 12oz. Cucumbers, fructose, vinegar, salt, mint, green food coloring, red bell peppers, mustard seed, sweet flavors, celery seed, alum, gum, less than 1/10 of 1% sodium, benzoate and potassium sorbate.